Norway’s central bank kept its key lending rate unchanged as expected, at its record low level, amidst news that Norway’s housing market is stronger than previously thought. Interest rates aren’t expected to rise until later this year, but the country’s currency is already strengthening. There was a rush of economic news even before the executive board of Norges Bank announced Thursday morning that it once again would keep its “key policy rate” at just 0.5 percent, the level where it’s been sitting firmly for nearly two years. The central bank’s governor, Øystein Olsen, noted that “the outlook and balance of risks for the Norwegian economy do not appear to have changed substantially” since December, meaning no change in the lending rate was warranted. The bank’s executive board that he leads also believes that an upturn in the Norwegian economy appears to be continuing. Inflation is low “but has moved up as expected.” Olsen hinted last month that interest rates may rise later this year. The country’s currency, the krone, has already been strengthening against the US dollar after months of weakness that many analysts and economists found hard to explain. Late last year it cost as much as NOK 8.20 or even more to buy one US dollar, but on Thursday it traded at just NOK 7.73 right after the central bank’s announcement. It’s still relatively weak against the euro, however, which cost around NOK 9.60 on Thursday, and the British pound, which was still trading at just over NOK 11. The krone’s earlier weakness has mostly been tied to uncertainty regarding the health of the housing market in Norway, and international concerns that it was looking like a bubble about to burst. Now a restructuring of Norway’s housing price index, aimed at providing what the national real estate brokers’ organization Eiendom Norge calls a “more precise” overview of the market, has prompted economists like Øystein Børsum at Swedbank to alter their outlooks. 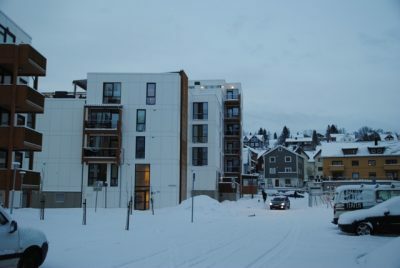 The new figures also show that housing prices in Norway are actually only falling significantly in Oslo, where they’d soared with double-digit increases to levels so high that affordability was under siege. Many analysts and not least would-be homebuyers see the recent price declines as a healthy correction rather than a major problem. At the same time, prices in other areas of the country including Bergen, Trondheim, Tromsø and Kristiansand have been more stable that thought. The housing market overall is thus more resilient and prices are rising again in several markets. It’s likely no coincidence, then, that the Norwegian krone was gaining more strength this week. Christian V Dreyer, chief executive of Eiendom Norge, was busy clarifying the situation for chief economists at many other banks as well. “The most important change we’ve made is to measure the regional indexes more precisely,” Dreyer told DN, which called the housing market the “joker” in the Norwegian economy. Norwegian analysts at both DNB Markets and Nordea Markets, tied to Norway’s two largest banks, predict that activity in the Norwegian economy will continue to rise this year.